Whether you are a DIY hobbyist who uses a beginner corded drill on a more casual level, or a professional contractor who relies on cordless power drills for your line of work (see our article on this here), one thing is for certain — Having the best drill bit is crucial to the outcome of your project. Drill bits come in a wide variety of shapes and sizes and are made in various materials and coatings made to suit specific projects, such as high-speed steel (HSS) which is a more economical choice made for boring into soft steels, wood, and plastic. View the Best Drill Bit on the Market, Below. How to use Drill Bits? What are Brad Point Drill Bits used For? How to Drill a Hole in a Metal Door? What Are Black Oxide Drill Bits Used For? What are the Best Drill Bits for Drilling Steel? Best Quality Drill Bits for Stainless Steel? Related: Best Drill Bit Sharpeners. Cobalt (HsCO) is an upgrade that includes a 5-8% cobalt blend with the base material, ideal for drilling into stainless steel and harder steel, and Carbide (Carb), the hardest bit, used mainly for production and should not be used in hand drills or in a professional drill press for the most accurate cylindrical hole. This review covers the top ten drill bits for everyday use, based on quality and durability. Ideal for wood or plastic, our Top Pick is the Dewalt bit set, which are coated with titanium to provide a longer drill life in non-ferrous (non-iron) materials, which makes them a great choice for commercial or residential applications. This bit set includes sizes that range from 1/6 inch to 1/2 inch, contained in a sturdy plastic case. See more information on DEWALT DW1361 Titanium Pilot Point Drill Bit Set. With the DeWalt brand, you really cannot go wrong. These bits are sturdy, versatile, and the titanium coating with the tapered web design gives them the extra durability they need to handle a wide array of projects from wood, to metal, drywall, and lightweight steel. The sturdy case included keeps everything organized. Sporting the newest technology, Drill Hog is proud to release these bits that are made from Cobalt M42 steel, which has a melting point of a whopping 2853 degrees Fahrenheit. This means that these bits are durable enough to drive through the toughest steel, like truck frames, stainless steel, farming equipment, and more. Proudly made in the USA, they receive our Premium Choice badge. See more information on Drill Hog 2.29 Pc Cobalt Drill Bit Set M42 HSS 29pc USA Drills. Drill Hog continues to impress us with its technology-savvy products. These bits are infused with cobalt M42 and have a tapered web, which means they are super durable and can handle a wide variety of hard steel like they were born for it. These drill on contact for cleaner holes and a longer life. Constructed out of High Speed Steel (HSS) with a titanium coating, these drill bits will deliver tough durability and a longer service life that will endure through multiple uses. The 135 degree split point tip and twist design is designed to be longer lasting and provide a cleaner hole than the more common 118 degree bit. High quality, yet affordably priced, this is our chosen product for Great Value. See more information on Tooluxe 10171L 13-Piece Titanium Drill Bit Set. With a titanium coating, these are packed with ultimate durability and will provide a longer service life through multiple uses without dulling. We love the 135 degree split point tip that helps prevent walking. Plus, this design ensures a cleaner hole, so no more chips and debris! Always a trusted name in power equipment, DeWalt delivers high quality to these bits that are coated with titanium to provide more durability and a longer life span when driving into non-ferrous metals. They have a tapered web to reduce breaking, and are ideal for boring in wood or plastic for both residential and commercial applications. DeWalt offers a 30-day money back guarantee on this product. See more information on DEWALT DW1354 Brad-Point Drill Bits. As a name you can trust, DeWalt does not disappoint with this drill bit set. Featuring titanium pilot points that start on contact, these heavy-duty bits are made to prevent walking, and the anti-spin no-spin shank is a treat. We love the durable carrying case that keeps it all organized. Great reviews! Constructed from 8% colbalt alloy and industrial grade high-speed steel, this 29-piece bit set is made to resist heat and extend the life of cutting edges. There is a 135 degree split point that starts drilling upon contact with less force and more durability, and the convenient tap and selection chart makes it easy to select the right bit for your project. There's also an overmolded rubber case that protects against damage. See more information on Irwin Tools 3018002 Cobalt Metal Drill Bit Set. These industrial-grade high-speed steel bits have an 8% colbalt alloy providing better heat and abrasion resistance. They did a great job driving into harder bolts that wouldn't come off with run-of-the-mill bits. Having cobalt alloy is worth the investment and ensures that you can complete the harder material tasks. This 30-piece set includes 1/4-inch hex shank that locks into both hex sleeves for quick and easy changing. These titanium-coated bits are roller-forged from quality high-speed steel that can be used in high-powered stationary presses, and the roller-forged and sharpened edges deliver fast, clean penetration that is ideal for automotive, industrial, and construction. See more information on Tooluxe 10055L Titanium Coated Hex Shank Drill Bits. These titanium-coated bits can be used in both drills and high powered drill presses and work very well for more demanding projects such as auto repair and industrial steel work. This 30-piece, quick change set comes in increments of 1/64-inch, meaning you won't be at a loss for the right size. Great product for the price. Made specifically for wood, this six-piece tri-flute wood bit set with its patented Blue-Groove design sports a thicker cutting edge and a 25 percent larger shank for more improved cutting and durability, with a full screw-point tip for grabbing securely to the wood upon penetration. Irwin is a trusted name for for superior performance and is a leader in bit technology. See more information on IRWIN Tools SPEEDBOR Max Wood Drilling Bits. These bits are specifically made for wood and designed to bore into softwoods quickly and accurately. There are some great reviews on this product that claim these work dramatically better than simple spade bits, the drilling is much faster, and the storage case works great with securing for easy transport. These DeWalt bits have a black oxide finish that provides better longevity and greater protection from wear. Sized from 1/16-inch up to 1/2-inch, these have a fluted design that is parabolic for greater strength, and a 135-degree split-poingt design that provides a more accurate, no-slip start. The rugged case container has a sliding soft-grip lock that secures and prevents lost bits. Ideal for metal, wood, and plastic drilling. See more information on DEWALT DW1177 20-Piece Black-Oxide Metal Drill Bit Set. DeWalt does it again with a great bit set that is worth the investment. These are great quality, durable bits and have received a lot of rave reviews about the overall quality and how well they work for a variety of metal and wood-based home projects. Drill America features their 29-piece, 1/64-inch incremental bits that are constructed to perform in a wide range of materials specifically in the iron and steel families. The gold oxide finish helps reduce friction and creates coolant pockets near the cutting edge that make these ideal for drilling in tough, hard metal materials for maitenance, construction, or portable work. See more information on Drill America DWD29J-CO-PC Cobalt Steel Drill Bit Set. Irwin does drill bits right with their M42 5% cobalt high-speed steel bits that deliver abrasive resistance when working with tough metals. With a heavy-duty spiral fluted design for faster chip ejection and a 135-degree split point tip for easy penetration, these tools are versatile and durable enough to use on a wide variety of materials. A metal index case is included for easy portability and organization. See more information on Irwin Industrial Tools 63221 Metal Drill Bit Set. Made with the super-durable 5% cobalt M-42 alloy, these bits are ready to tackle the hard stuff with features that include a heavy duty spiral flute design to bore cleaner and faster, and a 135-degree split point tip for easy penetration. Tested to work great in automotive repair with a lot of 5-star reviews, this set works like a charm and the metal case keeps it all organized. If you are looking for a tool that will do it all, then look no further. These will drill, countersink and counterbore a perfect sized hole for several screw sizes in just one step. These bits will produce clean, sharp countersinks and also create counterbore holes that are ideal for plugs or dowel buttons. The 1/4-inch hex shank can be used with power drills and quick change shucks. See more information on Snappy Quick-Change 5-Pc. Countersink Drill Bit Set. We simply love the fact that this Snappy bit set will do three projects in one. For the price, this set delivers high quality and durability in its drilling, countersink, and counterboring detailing. The Snappy brand is known for its durability and long life countersinks, and this set has received many rave reviews by satisfied consumers. 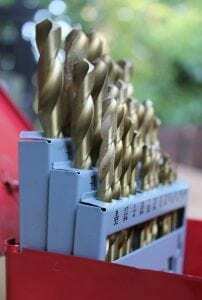 Drill bits are tools that are used with a drill to create holes in various materials, such as metal, plastic, or wood. These come in many shapes and sizes, depending on the type of project and what material is being drilled. To use a bit, insert the bit shank, the end that’s opposite of the cutting end, into your chuck–which is the cylinder-like clamp. Turn the clamp to tighten the bit into the chuck, and make sure the bit is tight and secure before drilling. All bits are designed to spin clockwise to drill, and counter-clockwise to reverse, so make sure your drill is going in the right direction. Allow the tool to do most of the work while you continue to apply steady pressure that is directly parallel to the bit. the bit should stay straight as it spins and not wobble. Not everyone knows this – but brad-point bits are made specifically for drilling into wood. These are special with a pointed end that is self-centering, allowing the bit to make the initial hole and bite right into the wood, rather than sitting all around the surface like others would do. If you are looking for something to saw Wood instead, please head over to our guide here. This pointed end, or brad point, acts like an awl and helps improve the accuracy of the drill, placing the bit exactly where you need it to be. There is also a set of cutting spurs on either side of the point which will slice the wood fibers upon contact, allowing for a smoother, cleaner hole. First, you would need to pencil in where you want the hole to be. Then, with a hammer (if you are looking for a drill to do the work for you, we’ve got the best hammer for drilling with less effort reviewed here), use a center punch, or a nail, to tap a small indentation at the mark. This step is important because if you do not tap a center mark, your drill will skate right across the surface and leave a mark. Then, insert the correct twist drill bit and drive into the hole, applying some pressure as you drill, staying in line with the bit. These are HSS bits that are heated up to 950 degrees Fahrenheit that creates a black oxide finish, resisting rust and corrosion, and reduces friction that helps speed up drilling. They are well suited for steel, copper, aluminum, brass, oak, maple, pine, PVC, polycarbonate, acrylic, nylon and composites. HSS (High-speed steel) bits work well for drilling into soft steels. Cobalt (HSCO) bits are an upgrade from HSS with 5-8% cobalt blended into the base material, making these suitable for boring into harder steels. Carbide (Carb) bits are the hardest of all and are primarily used in production with higher equipment, not to be used in hand drills or presses. Cobalt bits with a 5-8% cobalt blend are the most durable and suitable for all your stainless steel projects. We recommend the DEWALT DW1361 Titanium Pilot Point Drill Bit Set or the Irwin Tools 3018002 Cobalt Metal Drill Bit Set. You’d do well to match this up with a saw specifically used for cutting stainless steel. Most all drills and standard drill bits are interchangeable, so as long as your drill has a chuck size that will fit your drill bit, you should be fine. As a good tip, always get a number of different drills pieces so you don’t have to keep going out and buying more. Ranging in size from 1/16-inch to 1/2-inch, this 21-piece drill bit set reflects the high quality and standards for which Dewalt is known. Effective, durable, and long-lasting, these bits are ideal for the most common DIY woodworking or hobbyist projects, and rugged enough for the construction site as well for drilling through metal or PVC pipes. As for wood, their no-spin shanking means these will drill clean and concise, starting upon penetration for a clean hole. The titanium finish and pilot points on these help to protect them and give them a longer life, and the tapered webs add to their overall durability and reduce breakage. This set contains 21 pieces that are more than sufficient for any size drilling project. With an excellent 4.6 our of 5 star rating, many consumers are pleased with how well they work for the money, the large assortment of bit sizes, and the convenience of being able to stay organized in the plastic carrying case that is included with the set. This set is a great value. This 29-piece drill bit set by Drill Hog represents the newest in bit technology with many cool features. Constructed from cobalt M42 steel with a melting point of an amazing 2,853 degrees fahrenheit, these bits are made rugged and sturdy to drill through the toughest steel just like butter and can be used in a variety of projects that range from farm implements, to spring steel, 8 bolts, and more. With a 29-count ranging in 1/64-inch increments, you would be very hard-pressed not to find the perfect fit for your drilling needs. The 135 degree split point tip reduces walking and provides easier penetration with a cleaner hole. This set also comes with a handy round plastic case for storage, along with a belt clip for ease and convenience. Drill Hog includes a lifetime warranty with your purchase – just send back any broken ones and they will replace them, free of charge. What a great deal! We hope you enjoyed our article on "The 11 Best Drill Bits", if so, please share and rate it. 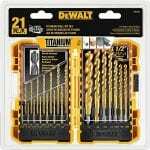 The DeWALT DW1361 is a great set of drills you get a good number of different sizes and they are titanium points so they will last you a long time and comes in a good strong case.